Lyndon LaRouche has provided the intellectual and political leadership in the fight for a new international economic order for the planet. The profound impact of LaRouche’s leadership is clearly reflected in the current actions being taken by the BRICS and others to create a new global financial architecture and strategic alliance among nations. 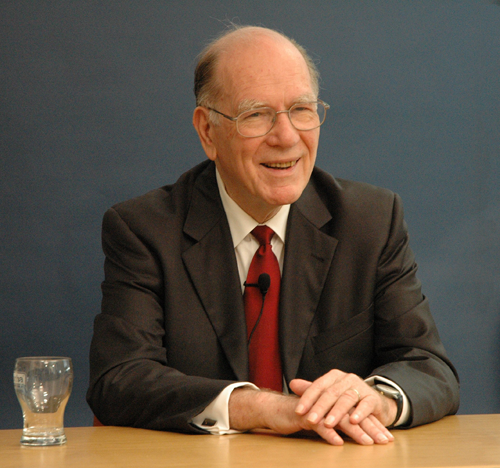 The following is a transcription of remarks made by Lyndon LaRouche on December 1, 2014. The United States’ establishment under its Constitution is unique. There is nothing in the rest of the world which corresponds to the intention of the U.S. Federal Constitution. We are an entity of our own making, our own type, as contrasted with practically every other nation on the planet. But what has happened is, there’s been a change in the process, a global change, that the United States is now, essentially, ruined by bad Presidents, especially the past two sets of Presidencies. What we need to do is return the United States to being the United States in its original Constitutional form. We don’t need to make any changes from that principle. But now, the rest of the world is a little bit different: What you have, for example, with the role of Russia, and its relationship to the BRICS formation. What’s happened is, that large nations, and to some degree smaller ones, as opposed to Europe in general, have emerged as major forces. That is, those nations as a group, represent a power, one of the greatest powers on the planet, in terms of political power. And that power is growing. What China’s doing, for example, in terms of space, in terms of the development of the organization of the space system, within Johannes Kepler’s specifications, that’s unique. So, we have to recognize that the United States is actually a very large part in its own right of what the new world order ought to be. But right now, we have a collection of nation-state systems which are very large, and they vastly outnumber us. What’s happening with the British Empire’s role, is, we were creating a pseudo-world system, and that’s what the problem is. If we in the United States get rid of Obama and the Bushes and so forth, get rid of that kind of filthy government, then we can readily come into a certain kind of accord with these other nations which dominate the planet right now, which essentially are the dominant features of the planet, in Asia, in South America, and so forth. So therefore, what we want to do, is we want to clean up our mess at home. But we have to also find out, how are we going to relate to these BRICS-types of nations; how are we going to relate to the Russia-China agreement, and so forth; how are we going to take all these large entities which will largely dominate the planet, and include the United States, as a very important element of that combination of nation-states? And that’s what we have to do. Therefore, we have to clean up the United States, to return it to its principle, get rid of all this stuff, like what the present Republicans seem to be doing right now—get rid of that! Get rid of Obama. Get rid of that stuff! And once we do, we simply have to reestablish the principle of the national Union. Because we will find then, that what will happen, is we will be a relative minority on the planet, relative to the large complexes such as in South America, what will come up in Africa eventually, what will happen in Eurasia generally. And Europe, old Europe, and so forth, will be small; the United States will be a very large entity, but not the biggest entity on the planet politically or otherwise. So we’re going to have to come to a new arrangement in which we have a new conception of what national sovereignty is. That question has not been posed clearly, as far as I can see, thus far. It’s important that we foresee where we’re going, or where we should be going. And that’s my concern. From my standpoint, I can see clearly where the United States must be going right now. Just simply take this new arrangement, which is not a simple sovereignty. It is something new. It is not the old notion of sovereignty. It’s a notion of a certain characteristic right of people, to have their own government, their own system, and to have these systems of government, the new systems typified by the BRICS, to come into concert with the United States under what I’ve been pushing for now: And let it flow! Because we’re going to find that, as is shown to us by what is being done by China in its space program, in which China has taken steps into nearby space in the direction of Johannes Kepler—we’re going to find out that the idea of what a human being is, as opposed to an animal, which is not clear generally, yet, is going to change. What China is doing especially with the space program, is going to change the way we define the meaning of mankind, and a lot of other things. So, just get ready to see those changes, folding into the system we have today. I would say that within maybe a couple of decades at least, to a couple of generations, you’ll find that the idea of what mankind is, what sovereignty is and so forth, is going to go through a revolutionary change. But it will be a peaceful revolutionary change, and a profitable one. We just have to proceed step by step, to march in that direction, and to reach the goals which that direction points out. Lyndon LaRouche also addressed this topic during a discussion which he led on November 29, 2014. The international system as it has been heretofore, is dying, and there are only two alternatives: general thermonuclear war, or a kind of unity among nations which we see coming out of the BRICS and similar kinds of fora. In other words, the only way that you can maintain society, now, on a global scale, is on a global scale. And that means you have to affirm the fact that the nations are all working, very much as Russia and China are. The Russia-China alliance is a measure of what’s coming, and we’re just a click away from that result. If you want to be sane, with the bankruptcy of the United States, the bankruptcy of Canada, the bankruptcy of the European nations, the Western European nations—they’re all bankrupt! And they’re never going to come out of that bankruptcy, as the kinds of nations they’ve been treated as so far. What’s going to happen is, you’re going to have the kind of system which the BRICS represents. The world system will be, in languages and so forth, language practice and so forth, will be somewhat differentiated. But the intention, to be accomplished, of what is to be accomplished, will be more and more unified. Languages will still be used, as such, but the principle, the intention will be unified. You’re getting that tendency in South America now. It’s much stronger there than other places. The Russia-China relationship is typical of this. "You’re going to have the kind of system which the BRICS represents. The world system will be, in languages and so forth, language practice and so forth, will be somewhat differentiated. But the intention of what is to be accomplished, will be more and more unified. Languages will still be used, as such, but the principle, the intention will be unified... You will still have cultures, national cultures, which may be unique and have unique characteristics of their own, but they’ll all be part of the same kind of process which is trying to find its general unity." The present system, which dumb Americans believe in still, is dying, and it’s waiting to be pushed off the boards, into maybe an empty swimming tank, which would probably make a mess of things. We’re going into a new system where mankind will be a unified system, unified in practices, by means of practices which effect that. There will be a dividing line in which the distinction is clear. You will still have cultures, national cultures, which may be unique and have unique characteristics of their own, but they’ll all be part of the same kind of process which is trying to find its general unity. We are now saying, we’re going to a new system. Because we need to have close collaboration with our ally, China, and with other nations, which are close allies, in principle, in intention. And gradually, we’re going to find more and more agreement, more and more integration based on the search for realization of necessary revolutions in practice. And we’re going to all be united by the principle of Johannes Kepler.